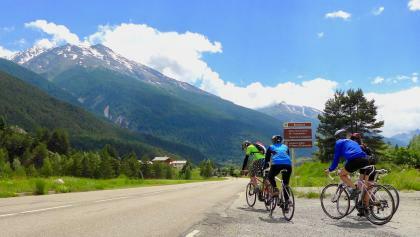 Route des Grandes Alpes: the most beautiful alpine cycling adventure ! No need to go to the other side of the world to offer you the most beautiful trips! 700 kilometers, 18 mythical passes and 14 stages, the Route des Grandes Alpes is undoubtedly the most majestic mountain cycling route. 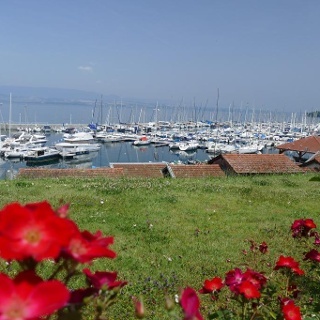 From Thonon-les-Bains to Nice, as soon as the snow melts, this unique route is opened to travelers only for a few months, from early June to mid-October, depending on the snow cover, and invite you to enjoy for a few days, a week or more what the french side of the Alps has best to offer. The great passes such as Iseran, Galibier, Izoard or Cayolle, Colombière, Bonette, or Cormet de Roselend are all milestones along this incredible journey and promise both panoramic views and great victories! Even if the Tour de France has crafted the legend of this route, everybody is welcome to discover it at its own pace and to take the time to enjoy the heart of the typical villages of the alpine valleys, to walk to one of its magnificent viewpoints at the top of the passes, to visit a dairy cooperative or a museum of traditions and to meet those who live on the Route des Grandes Alpes. If you will need courage at every stage to overcome the positive elevation, today the route becomes more accessible to the greatest number. Indeed, the entire course is punctuated with e-bike charging points, distributed every 30 to 40 kilometers. Thus, going in groups of different levels becomes possible. 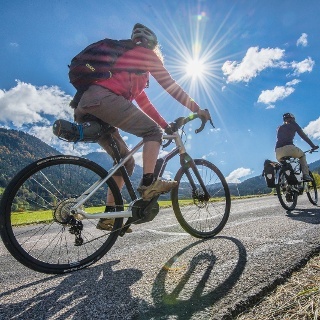 If some cyclists will prefer to ride a "classic" bike, others will be able to accompany them on e-bikes and catch the dream of the route and its high passes! So, ready for an incredible trip? 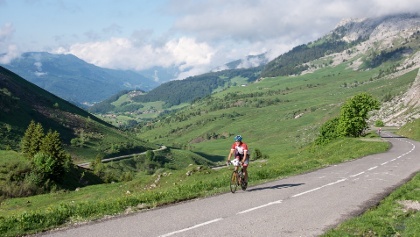 The two best periods to travel the Route des Grandes Alpes are from June 1st to mid-July and from late August to mid-October (depending on the snow cover). Traffic is less important than in mid-summer and moderate temperatures are better for cycling several days in a row. In any case, it will be necessary to inform you about the weather conditions and to make sure that the roads are completely accessible and cleared of snow. Accessible to everyone, whatever your physical abilities, adapted to all types of courses and fun, e-bike allow to perform longer courses with ease. Climbing passes become real moments of contemplation and are no longer discouraging or synonymous with suffering for the less athletic. 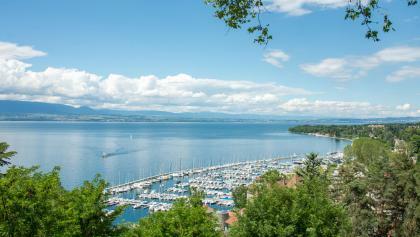 Kilometers accumulate and bring their quota of landscapes, meetings and slices of life quite simply. 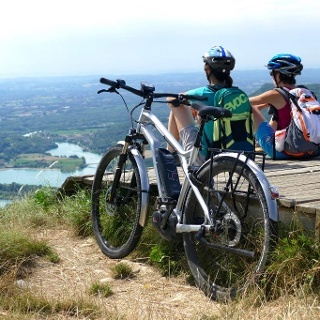 The different stages will be as many opportunities to discover the terroirs, the wealth of the heritage and will allow you to recharge your batteries (yours and your e-bike's) before going on the road again. To get the most out of the engine assistance, make a stop at the recommended addresses to recharge your battery and leave safely. A consumption index has been calculated for each stage to control its autonomy and anticipate any breaks needed to recharge its battery.You will also find all along the route e-bikes charging stations Bosch with battery racks. These will allow you to charge your battery and to deposit some of your gears there for a visit. 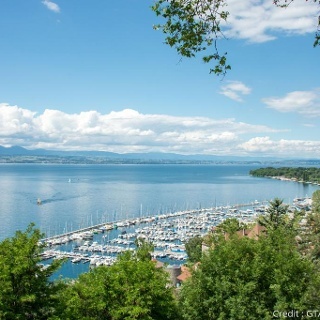 From Thonon-les-Bains, the route follows the historical route of the Route des Alpes, as it was originally designed, notably by the Touring Club de France, which has developed car tourism in the Alps . 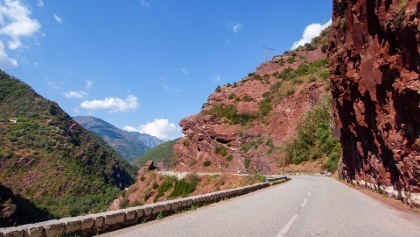 It evolves through the mountain range to reach Nice passing by the most majestic road passes such as Colombère, Iseran, Galibier, Izoard or Cayolle. 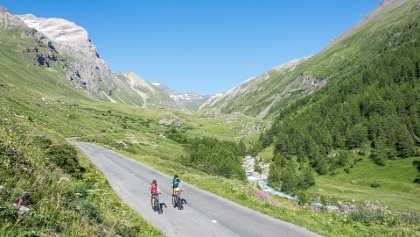 And beyond the main route, the Route des Grandes Alpes also offers several variants (see "alternative routes") that offer cyclists as many combinations as possible to cross the Alps and discover even more its riches. Between massive mountains, valleys and mythical passes, the Route des Grandes Alpes offers you the best of the Alps "à la carte". Beaufortain: Bordered by the Mont Blanc massif, a real backdrop to this stage, the Beaufortain is a favorite for many visitors. If its cheese, the Beaufort, has largely contributed to its notoriety, it is its preservation and its wild and authentic side which make it an exceptional territory. 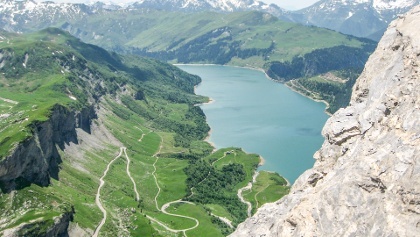 The Cormet de Roselend and the nearby dam form a unique and wild landscape, where the blue of the lake contrasts with the green and white of the surrounding mountains. The Tarentaise and the Vanoise massif: The valley which goes from Bourg-Saint-Maurice to Val-d'Isère is famous for its famous ski resorts. 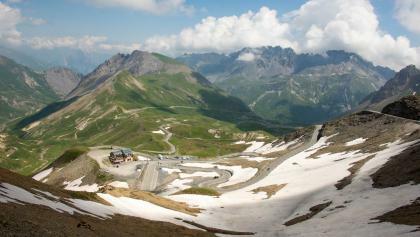 On the edge of the Vanoise National Park, the route takes a road that crisscrosses the bottom of the valley to end in high point in Val-d'Isère and a little higher at the Col de l'Iseran, crossing point to the Maurienne Valley. The Maurienne Valley: With its 120 km between Italy and the Hautes-Alpes, the Maurienne Valley holds the record for the longest alpine valley. 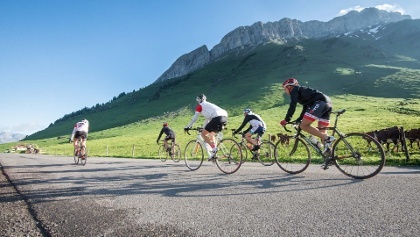 But it is especially its concentration in mythical passes that makes it a well-known territory for cyclists. Moreover, it claims it openly by displaying itself as the "largest cycling area in the world"! 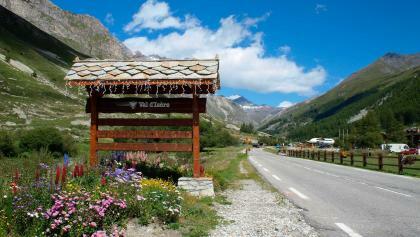 And if Iseran and Galibier make it famous, the valley also gives access to the crosses of the Croix-de-Fer, Madeleine or Mont-Cenis, as many variations on the main route. 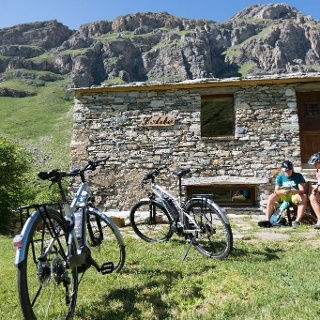 Queyras: When we arrive from the north, we reach it by the Izoard pass, which some people call "the most beautiful pass of the Route des Grandes Alpes". Its Mediterranean landscapes, sometimes lunar, make the traveler sway in the Queyras Regional Nature Park, one of the jewels of the Alps. Between larches and Scots pines, this massif where time seems to have stopped is incredibly rich, away from the beaten track. 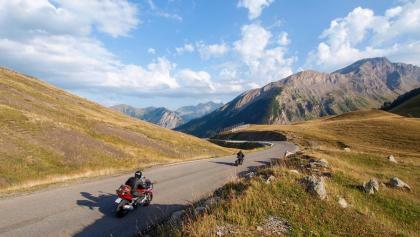 The Ubaye valley: Between Queyras and Mercantour, the Ubaye valley is just as wild as torrential. Renowned for its whitewater activities, it has other assets also renowned as Barcelonnette and its famous Mexican villas. 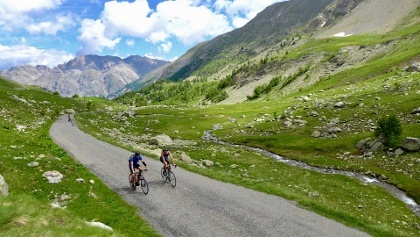 It is here that you will have to choose between the main route that leads to the sumptuous Col de la Cayolle or the variant that will take you to the heart of the Mercantour via the Col de la Bonette. A Corneal choice! 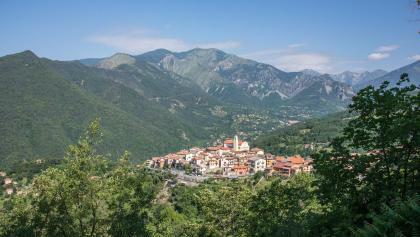 Mercantour: Backed by Italian Piedmont, this 150 km long national park includes the last peaks of the Alps before diving straight for the sea. Here, the landscapes are clearly southernish, without doubt is due to the direct proximity to the Mediterranean whose cultural influence is felt even in the architecture of villages and works of art and history. 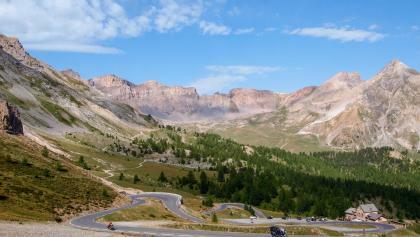 Accessed by the highest road in Europe, the Col de la Bonette offers grandiose and incomparable views. Le Haut-Pays Niçois and the Côte d'Azur: Made of steep roads and perched villages, the high-country Nice is the last chainlink of the Alps before the "Big Blue". The sea is omnipresent and the Col de Turini will be the last great effort to provide before diving on Menton and the Côte d'Azur. 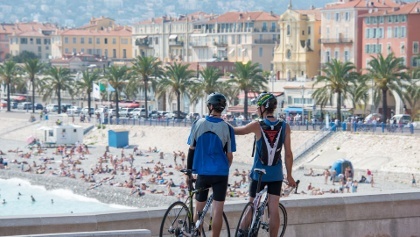 From there, the Mediterranean will accompany you with its sweet presence to Nice, where only the Col d'Èze, the last highest point of the route will remind you of the incredible challenges you already achieved. Many train stations (SNCF) are located at the start and finish of the Route des Grandes Alpes but also all along the route to facilitate access to the heart of the Alps. Stage by stage, this guidebook offers a precise discovery of the route and its riches, with all the practical information to organize your stay by bike or electric bike: maps, profiles of stages, accommodation, charging sites and consumption indices for your E-Bike batteries. Indispensable if you want to have a precise and global point of view of the route, IGN has published in 2017 a very complete map on the Route des Grandes Alpes, with among other information for cyclists electric.